In the first session of the recent International Business and Financial Summit (IBFS), senior industry practitioners took a look at how jurisdictions round the world are adapting to an increased regulatory environment and what opportunities this presents for growth. 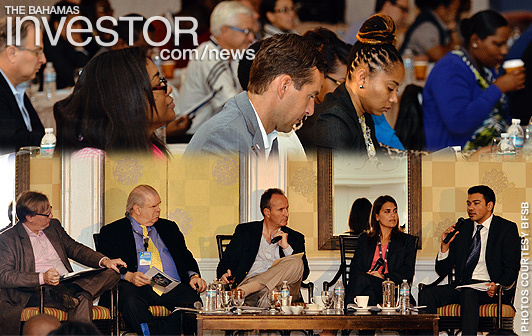 IBFS 2014 was organized by the Bahamas Financial Services Board (BFSB) and was held January 23-26 at Sandals Emerald Bay in Great Exuma. Case studies for the session included Switzerland, London, Singapore, Hong Kong, China, New York, Miami, San Paulo and The Bahamas. Session 1, “Benefiting from the New World Order,” examined the aforementioned jurisdictions in the context of wealth management services provided and target clients. Panelists included a trio of Withers LLP experts–Joseph Field, Shahjahan Ali and Jennifer Laurine–along with Financial Services Minister Ryan Pinder and moderator Simon Beck of Baker & McKenzie LLP. Panelists not only described the business growth and evolution of the case study jurisdictions over the last five years, but also the incentives each jurisdiction provides to encourage growth. They also spoke of key strengths and weaknesses of those jurisdictions and described how these financial centres have positioned themselves with regard to the exchange of information for tax purposes and key agreements they have entered into. Panelists also discussed how the jurisdictions encourage or discourage clients from purchasing homes or taking up residence in these jurisdictions and how they will develop in the future. Speaking at the International Business & Finance Summit last weekend, experts in a range of fields including private wealth management, banking and financial media urged delegates to be aware of global trends and be innovative and flexible. Sandyport Beaches Resort and Hotel has won the RCI Gold Crown Resort award, the highest of the three RCI designations largely determined by vacationers' comments. See a photo after the jump.